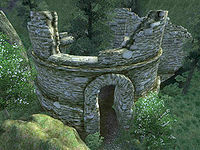 Fort Farragut is a small fort east of Cheydinhal containing undead (quest-related). It contains only one zone, Fort Farragut. The Purification: Things at the Sanctuary have gone sour, and the Brotherhood can't afford chance or weakness. A trap door in the roof of Lucien Lachance's chamber leads to the inside of a hollow tree northwest of the main fort door. This secret entrance can be used at any time, allowing total bypass of the fort's guards. 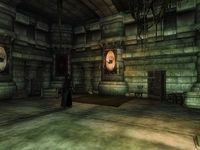 Lucien Lachance will only appear in Fort Farragut after the Dark Brotherhood quest Of Secret And Shadow (the prelude to The Purification) has been started. 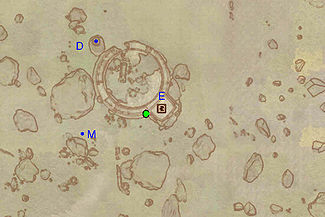 A guaranteed magic item, a Base Ring of Speed, can be found outside the fort. The ring is located outside on one of the ruined walls. Go to the second level by climbing the hill outside in back, then go to the left and jump onto the wall in the front. You should be standing in a gap in the wall, looking straight at Cheydinhal. Look down and you'll see a small ledge in front of you. Step on the ledge and slowly follow the ledge to the left. You'll find the ring in the middle of an "X" configuration of gold coins. Grab the coins near the edge first so you don't accidentally knock anything down. This fort contains 18 Wisp Stalk plants. This fort also contains 10 poisoned apples in a barrel to the right of the trapdoor. Poisoned apples are rare items that sell for high gold. They respawn every 72 hours. This location's map marker (M on map) is named Fort Farragut (editor name FortFarragutMapMarker). The entrance door is ENE of the marker, 110 feet away. This zone serves as a gauntlet to reach Lucien Lachance at Q during the start of The Purification. 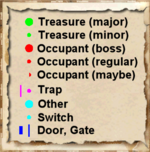 Incidentally, Lucien can be reached via a shortcut (see notes) but the rest of the fort still contains enough valuables to be worth exploring, although the path from the real entrance at C is fraught with traps. Upon entering, you will first come to the gate at M, which is opened by pulling a lever to your right (cyan dot on map). The gate opens into a medium-sized chamber, with two paths leading deeper into the fort, and one path leading to the bridge in the middle of this room, which has a minor loot chest on it. The path to your right is the least dangerous route, but it is blocked by gate N, locked with a hard lock. If you are unable to unlock the gate, you must take the path straight ahead, which leads to a dart trap (G) that you cannot avoid. 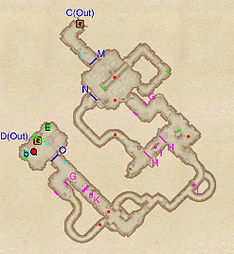 The "N" path leads to a dark guardian and a cave-in trap (I), which can be avoided by jumping over the tripwire triggers at H, or by running by the rocks before they fall. Both paths ultimately lead to the same small room with a dark guardian and a minor loot chest. The room branches off to a dirt path, with a hole and spike trap at L that can be jumped over if you spot it in time. Next up is an intersection with the left path leading underground, the way back if you fell into the hole; proceed forward and avoid going underground at the next intersection as the upper level will net you an avoidable swinging mace trap (J) rather than an unavoidable dart trap (G) underground. This path leads to a long corridor, which ends at gate O. Avoid the trap at J and pull the lever to open the gate. This lever also kills the remaining Dark Guardians in Fort Farragut. Head into the chamber of Lucien Lachance and loot the two chests, a jewelry box, two human hearts and a respawning, and very hard locked, barrel at E filled with ten poisoned apples. Esta página foi modificada pela última vez à(s) 07h55min de 14 de outubro de 2013.